Miss Isadora Delafield may be an heiress, but her life is far from carefree. When her mother begins pressuring her to marry an elderly and uncouth duke, she escapes from the high society world she's always known and finds herself to be an unlikely candidate for a housekeeper position in rural Pennsylvania. Flight of Fancy is the first book in Jen Turano’s new series American Heiresses. It is a fantastic book with an American heiress, a self-made hero, fun loving secondary characters, sweet children, dastardly villains, mystery, and a chicken named Elmer. But in addition to all this it is a story that helps you to evaluate your life, your goals, and your faith. Our story centers around American Heiress, Isadora Delafield, who has lived a very sheltered life where she has not seen much of the world outside of her social circle. It was such fun to see a historical general store, a working farm, and a small town community through Izzie’s eyes. I found her perspective charming, informative, and very fun to read. It was how I imagine any of us who were not a part of the time period would have seen the world around us. Our hero is Mr. Ian MacKenzie, a self made man of fortune. He came from humble beginnings and his past has a way of creeping up and trying to influence his future. He was easy to root for and is enchanted with our heroine. I am a huge Jen Turano fan and have read all of her books. But, I am going to say this is my new favorite. Flight of Fancy is everything a historical romance should be and more. You really do not want to miss out on reading it. I highly recommend it. I was given the book by the publisher and not required to write a review. 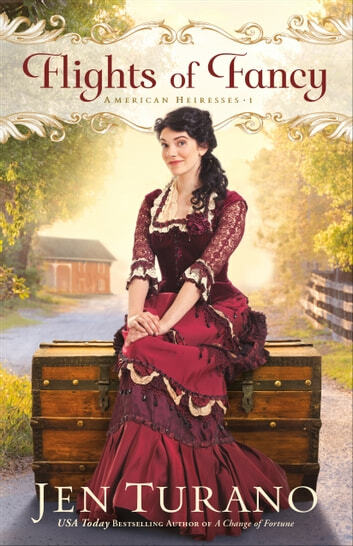 Flights of Fancy by Jen Turano is the first book in the American Heiresses series and I must say I am looking forward to reading the rest of the series. It is a delightfully captivating story. A young wealthy woman is being coerced into a marriage with an old and rather villainous man who just might even be a murderer. The answer to her dilemma seems to be to hide out in the countryside as a housekeeper and she can barely even manage to dress herself let alone take care of a household. A household which consists of a somewhat confused old man, his laid up wife and four young children from an orphanage, and add to that all the feisty farm animals who always seem to be on the loose--Buttercup, the cow who thinks the house is her stall and Elmer, the chicken who often finds its way under Izzy's skirts to peck at her legs. Isadora's adventure into life as an inept house manager has some lessons of faith as characters learn to trust God to care for and lead them. Lots of witty humor, relatable characters, some mystery, and of course, a lovely romance. Who could ask for more? I received a complimentary copy of this book via CelebrateLit. A favorable review was not required and opinions are my own. This review is part of a CelebrateLit blog tour. ust when I think Jen Turano can’t come up with any fresh ideas for her hilarious historic comedies, she proves me wrong again. I loved the spirit of adventure and positivity that Isadora (“Izzie”) possesses. The Duke of Montrose sounded like a “monstrosity” of a man and nuisance. On the other hand, how many readers will find themselves enthralled with Ian and his love for his fellow man (well, his looks COULD play into the picture.) Uncle Amos and Aunt Birdie are pure strokes of literary genius and the four children are beyond lovable. Now I can’t wait for the next books in this series. Some favorite quotes: “...God occasionally throws obstacles our way so we’re forced to grow into the people he wants us to be.” “...what with how often people forget to show kindness to those most vulnerable. I imagine it must pain God no small amount when He witnesses us ignoring those in need.” During the time I was reading this, I heard, “Good, Good Father” by Chris Tomlin on the radio. Somehow it seemed very apropos to the book. I received a complimentary copy of this book from the publisher through Celebrate Lit and NetGalley. All opinions are my own and no positive review was required. Flights of Fancy by Jen Turano takes us back to July of 1885. Isadora Delafield has a mother determined to marry her off to a gentleman with a title. The older Duke of Montrose has set his sights on Isadora and her mother, Hester is thrilled with the match. Isadora is repulsed by the Duke and his reputation sends her running with the aid of those who care for her. Isadora or Izzie finds herself in Canonsburg, Pennsylvania applying for the position as housekeeper at Glory Manor. With a name like Glory Manor, Izzie imagines a large residence where she can direct and organize servants which happens to be her expertise. Mr. Ian MacKenzie was raised by Amos and Birdie Alderson on their farm, Glory Manor. Birdie was injured in a plow incident and Amos has been forgetful lately. Ian needs someone to take care of them while he is managing his business interests in the city. He was unprepared for the four Duffy children that a social worker has put into Birdie’s care. Ian has his doubts about Izzie’s qualifications especially after he must show her how to use the washing machine, but he is in a pinch plus he finds Izzie intriguing. Izzie finds herself adapting to her new situation, but she is concerned by malicious activities happening at Glory Manor and other surrounding farms. Izzie and Ian will need to work together to overcome unexpected challenges. What happens when someone threatens those they love and a promising future? Flights of Fancy is a delightfully entertaining historical novel. I found the book to be well-written with steady pacing. Isadore Delafield is a great character. She has a controlling mother who wants her daughter to marry a man with a title. The Duke of Montrose fits the bill, but he is twice Isadora’s age. When her best friend’s butler, Mr. Hatfield learns of the Duke’s intentions, he informs Mr. Godkin, the Delafield butler, of the man’s character and what happened to the Duke’s other three wives. The two men come up with a plan to keep Izzie safe. Ian MacKenzie is grateful to Amos and Birdie Alderson for taking him in as a child and making sure he got an education. Ian is now a successful businessman who is determined to marry a society lady. I enjoyed the witty repartee between Izzie and Ian. Izzie has no clue how to perform the most basic of tasks, but she is a whiz at organization and hiring others to accomplish her plans. Add in four rambunctious children, a cow who prefers a house to a barn and a chicken (who really should have been named Nigel). Also, Izzie tends to be long-winded with her unusual explanations (which make Ian forget what he asked in the first place). I found myself laughing from beginning to end while reading Flights of Fancy (I am talking about laugh-out-loud laughing). Jen Turano captured the historical period with her descriptions of the homes (mansions), the beautiful clothing, the attitudes of men and women (especially society mother’s like Harriet Delafield), the transportation utilized, the historical figures mentioned, and the types of businesses run. The Christian element is light but well thought out. Birdie is the character with the strongest faith which she shares with those in her life. My finger was kept busy flipping the virtual pages of my Kindle as I devoured this book. Flights of Fancy is a captivating story with romance, action, rich historical details, suspense, and whimsy.